A pair of stinky two strokes waiting for a train at Bewdley station. Monday saw me finishing off the handlebar switchgear wiring for Andy M's Starfire. Tuesday was spent mainly sleeping - due to not going to bed last night. Wednesday and it was over to Fred's in the Bongo - I now have a tow bar assembly for the B33. Thanks Fred. Thursday and I noticed the Bongo's left rear indicator seems dull - took the light unit out and found a Scotchlok connector on the indicator wire. Friday and I removed the Bongo's rear light units and replaced all the Scotchlok connectors with soldered bullet joints. Saturday was another day of not doing very much at all. 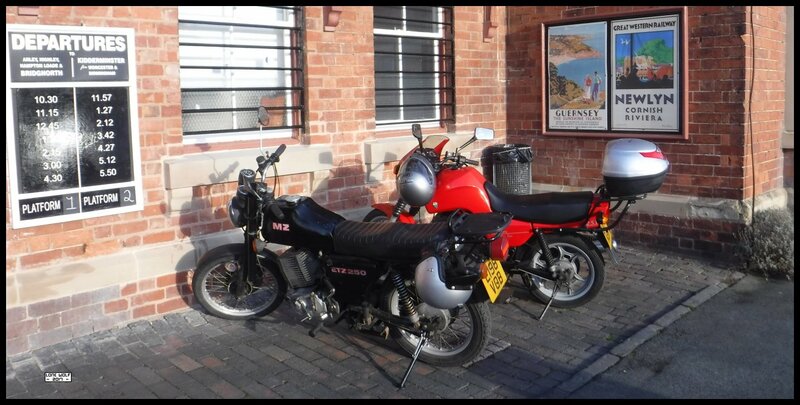 Sunday and a pair of stinky two stroke MZs headed off for dinner at the Riverside Cafe in Bewdley.